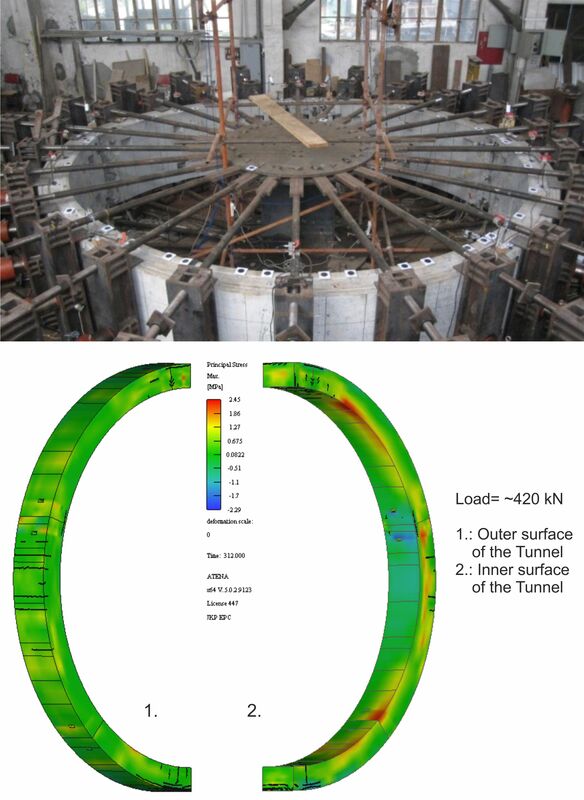 JKP Static Ltd. based in Hungary analyzed a one-to-one model of the full tunnel section with ATENA at the Tongji Univesity in Shanghai. At JKP ATENA has been used extensively for completion of their worldwide projects for several years. The issue of efficiency, especially time, material and cost savings, is highly demanded nowadays. Most notably, evaluation of these aspects generally contributes to a succesfull project realization. In the the first stage of this project, the real deflections of the original RC tunnel were modelled and compared. The numerical model showed excellent correlation with the test results, so in the next stage an optimisation process was started, where steel bars were replaced with suitable fibres. The design process was supported by experimental program, and the numerical simulations in ATENA showed very good correlation with the full-scale physical test results. The numerical modelling in ATENA showed that the significant reduction of steel reinforcement by 50 and 75% respectively could be achieved.